Don’t leave my this way! UPDATE. My Glass library contains an improved version of this behavior. Take a look at it! Aha! So you just discovered that users tend to break your applications typing everything you could imagine. Validation in Hell! Imagine you have some information that has to be filled in. 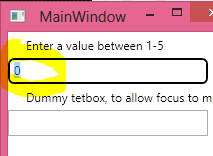 For example, this Window tell you to enter a value between 1 and 5. It may be not obvious to the user that information is extremely important. So you cannot leave it in an invalid state. Boy, those mandatory fields must be valid before you go away! But, how do you keep they into the TextBox? The user types “2000” and suddenly, they change the focus to the Dummy text box. The required TextBox will show its value is invalid, but maybe the user is happy with that red TextBox and starts to touching here and there with something that is wrong. This can be, of course, perfectly acceptable, but sometimes the information you request just cannot be left in an invalid state. That is why I made this Interaction Behavior. KeepFocusOnErrorBehavior. 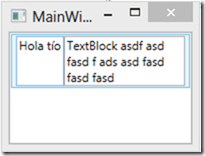 As you can see, this behavior is attached to the TextBox and its ErrorCommand is set to a Command (in a View Model). This command makes it even better, because you can, for example, bind a Command that shows a message indicating that you’re not allowed to go anywhere before entering correct input. // Forces to update the binding. As we are preventing the focus to be lost, its binding never updates and never recovers from a previous error. Una barrita de desplazamiento, o también llamada “ScrollBar” te la meterá doblada y arruinará tu layout a la primera oportunidad. ¡Y así, la fiereza es dada!